Window screens, patio enclosures, screened decks, screen rooms, etc. Prestige Construction LLC has been working with screen in all types of settings in the area since 2003. Prestige Construction LLC provides on-site window screen installation, repair, and replacement. Whether it's a double hung window, single hung window, sliding door screen, bay window, or any other, Prestige Construction LLC has the expertise and training to complete your project. Imagine enjoying the summer without having to worry about the mosquitoes, or being sunburned, or even getting rained on while having a cookout with friends or family. 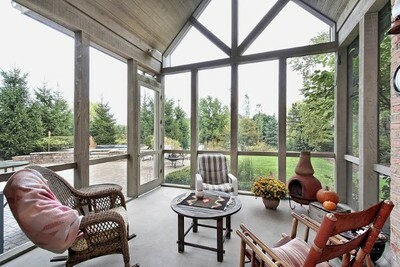 Patio enclosures can serve several purposes, without obstructing your view. Whether you're interested in having an enclosure added to your patio, deck or pool, the technicians at Prestige Construction LLC have the training and experience to complete your project in no time. Call Prestige Construction LLC at (219) 213-6336. Looking to add an extension to your home? Get the best of both worlds, being somewhat indoors, while enjoying the outdoors. Screen rooms allow you to enjoy the outdoors without having to worry about the pesky mosquitoes and other critters, or even the sun. Prestige Construction LLC specializes in converting an existing space into a screen room or building a new one from scratch. We can also provide you the option of having your screen room "glass ready", meaning you can easily convert the "screen room" to a "sun room" with minimal effort. When you're searching for the right contractor for any of your "screen" projects, know that Prestige Construction LLC has been a trusted contractor since 2003. Give us a call for your free estimate on your "screen" project.